Insomnia, dry eyes, hot flashes and other symptoms may be a sign that your yin and yang are not in balance. Yin deficiencies are particularly common if you're overworked or stressed. Making a few changes to your life and your diet may be all you need to do to restore normal levels of yin and relieve your symptoms. 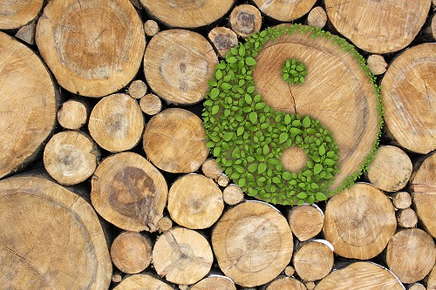 Early Chinese philosophers believed that everything in life is affected by opposing forces known as yin and yang. They described yin as female, cold, dark, shady and passive and noted that yang is male, hot, light, sunny and aggressive. The perfect balance of yin and yang is essential to your good health. If one force becomes stronger than the other, you may begin to develop a number of unpleasant symptoms. What Are the Signs of a Yin Deficiency? Yin deficiencies can occur when you do anything to excess, whether it's working or studying too much or spending too much time partying, or attending social events. Stress can also play role in yin deficiencies. If you work in a stressful job or are dealing with a difficult family situation, you may soon experience insomnia, dry mouth, and other classic yin deficiency symptoms. Yin tends to decline naturally as you age. Even though your busy schedule may have caused no adverse effects in your younger days, continuing to work long hours or spending too many evenings away from home can eventually take a toll on your health. Common menopausal problems, including hot flashes and night sweats, are often caused by yin deficiencies. When your estrogen and progesterone levels drop, your body is no longer in harmony. Other causes of yin deficiency can include chronic diseases and conditions, environmental toxins, chemotherapy, and drinking too much alcohol. How Can I Keep Yin in Balance? Find a way to reduce your stress level. Many people find that anxiety and stress decrease when they practice meditation and yoga. Any activity you enjoy, whether it's playing a sport, knitting, attending musical performances or painting, can be helpful. Devote eight hours of your day to sleep. Cutting out a few hours of sleep may seem like an easy way to ensure that you get everything done when your life is busy. Because a good night's sleep helps restore yin, lack of rest can lead to a chronic yin deficiency. Exercise daily. Exercise keeps your bones and muscles strong, reduces stress and helps balance your yin and yang. You don't have to attend classes or devote hours to exercise. Whether you walk, ride an exercise bike or garden, you'll help replenish your yin if you exercise at least 30 minutes every day. Stay hydrated. Drink water throughout the day to ensure that your fluid level remains stable. Avoid hot showers and baths. When you already feel hot and your skin is dry, hot showers and baths can only make your symptoms worse. Try setting the water temperature to lukewarm instead. Stay away from caffeine and spicy foods. These foods can worsen yin deficiency. Make time to relax. You don't have to be busy every minute that you're awake. Embrace the idea that it's perfectly fine to do absolutely nothing occasionally. Stare at the clouds, go for a walk, or enjoy time with your family. Visit an acupuncture practitioner. In addition to acupuncture treatments, practitioners can suggest dietary changes and recommend herbal formulas to balance yin and yang. For example, American ginseng may be recommended to bolster your supply of yin and reduce stress, while polygonatum odoratum may have a cooling effect on your body. Your practitioner will recommend or prepare herbal remedies based on your symptoms and the source of your deficiency. Do you have any of the symptoms of yin deficiency? We can help you relieve your symptoms by restoring your body's yin-yang balance. Contact us today to schedule an appointment.